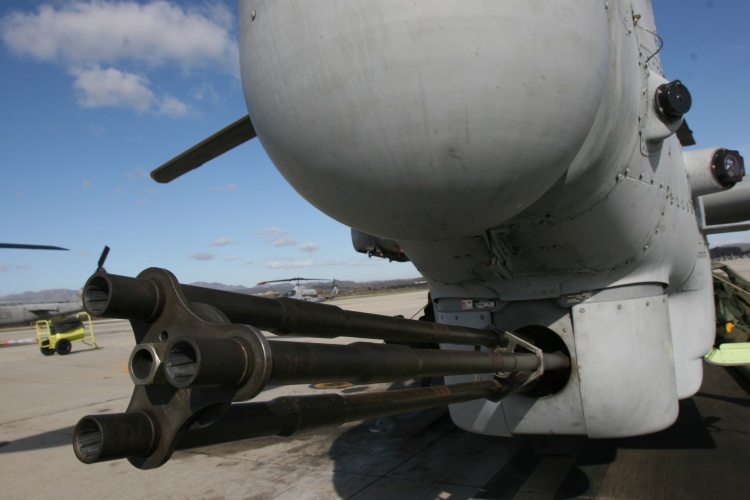 Marine Corps Air Station Miramar, California, 19 December 2008 — A three barreled M197 20mm Gatling gun rests in front of a AH-1Z "Viper", the latest gunship to join the Marine Corps. The new Cobra can hold more than 700 rounds and fire them at a rate of approximately 730 per minute. The new Cobra can also carry twice the number of Hellfire missiles compared to the AH-1W Super Cobra. U.S.M.C. photo taken by Lance Cpl. Christopher O'Quin.